The Saints are Coming was originally by The Skids. Originally when the song was written by Richard Jobson the lyrics were about a friend of his who had recently joined the British Army, and been killed on tour of duty in Northern Ireland. When released as a well recieved collaboration between Green Day and U2, the song was a charity single to benefit people affected by the damage caused by the now infamous Hurriance Katrina. 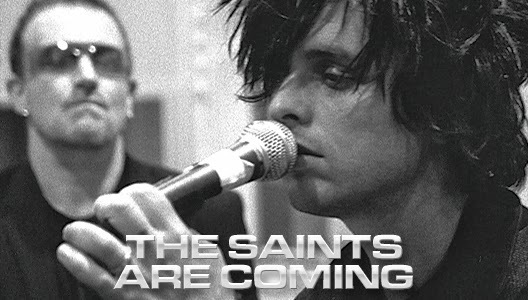 The Saints features the lyrics / verse of the House of the Rising Sun by the Animals at the start, a none too subtle reference to New Orleans and Hurricane Katrina. Check out the lyrics to Ordinary Love by U2. Green Day have a new song called Bang Bang.